Dr. Arvin Karu, PNG’s first qualified cardiac anaesthetist, was interviewed by Geraldine Coutts for Radio Australia’s Pacific Beats program this morning. He spoke about the development of PNG’s own sustainable cardiac surgery program which Open Heart International has been assisting develop over the last 19 years. During our trip to PNG in August, Dr. Karu was examined under the watchful eye of two of the OHI volunteer team, and has now received a Masters qualification in Cardiac Anaesthesia, which is a globally recognised qualification. 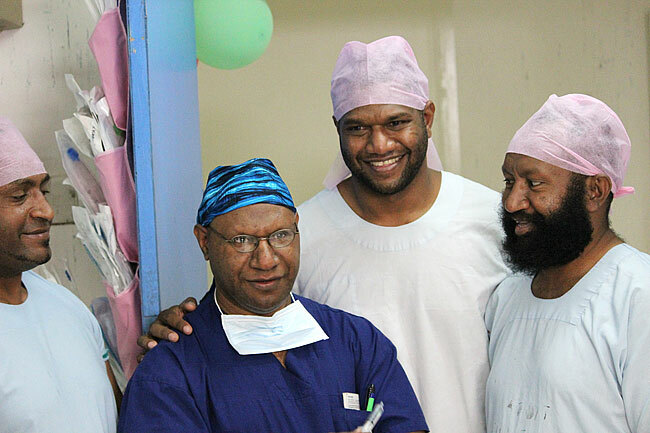 Dr Karu, in the blue cap, is pictured with some of local business supporters in PNG.